Do you have a 2019/20 Ticket to Golf coupon booklet? Enter to WIN a GolfBC Prize Package, with your Contest Code found in the book! Contest starts February 15th, 2019 and will run through February 1st, 2020 with three prize draws throughout the year! More information on the prize packages coming soon! How Can I Get a Ticket to Golf Coupon Booklet? 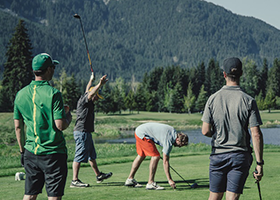 If you were not one of the 1,000+ golfers who entered to win one at the Vancouver GolfExpo, you can purchase the coupon booklet at any GolfBC golf course in British Columbia (while supplies last) for $89.95. Or, participants in various charity golf events hosted at a GolfBC facility might find themselves lucky enough to receive one in their Tee Gift bags! Be sure to sign up for our monthly GolfBC eNews to be notified of upcoming contests and promotions! We only email once a month, and never share our list with any other company.